In the small tunnel we (Alfie and I) have been busy propagating, the bench and the tables outside are packed. Above the bench, the fig tree is having a second crop after a gap of a few weeks. Alfiie took a photo of me pruning the peach tree. Grapes are ripe in the small tunnel. In the big tunnel Alfie helps, using the secateurs to cut the old leaves from the tomatoe plants. Winter lettuce, spinach and Winterkiefe peas have been planted. 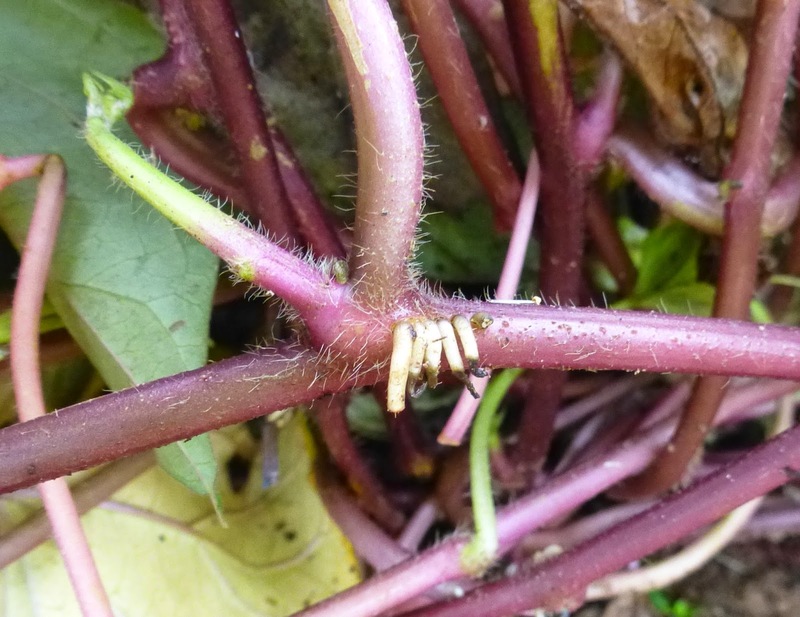 ..to prevent the plant making new roots along these stems, as seen in this photo. The plants energy needs to go into making sweet potatoes instead. ... and the Robin surveys. Summer photos of the little Kerry herd. Mulching and planting infront of the big tunnel. A photo journal of seasonal activities, plants, animals, weather and wildlife here at Honeyoak in Ireland. The little Kerry herd 2013. Copyright Honeyoak 2013 - 2018. All Rights Reserved.. Powered by Blogger.